Art, it's said, is supposed to comfort the disturbed and disturb the comforted. In Derry art is used as a way to commemorate those who were lost in all the riots and marches. No one's lives were untouched by the all the anger in hate in Derry and the Bogside Artists have made it their duty to honor everyone through their murals. During the 70's all humanity was lost in the Bogside of Derry. Could you imagine walking out of your door in the morning to catch the bus and not knowing if you're going to make it because there are armed soldiers waiting to chase you down if you look at them wrong? Could you imagine not being able to go get food because there are military personnel blocking off the shopping center? The British Protestants were trying to shut down the Irish Catholics, force them to give up, but, in typical Irish fashion, the Catholics refused to give up. The Bogside artists don't paint their murals to create hate, or upset people, they create their art to commemorate their friends and family who died. Our tour guide had many personal stories of people who died during the Troubles. One story was of one of his friends. When they were just young kids his friend got blown up in his childhood home backyard. He said "I actually remember putting pieces of his body in the garbage can after his body was taken away." Everyone here in Derry knows someone who died during the troubles. The Bogside artists go by this motto, "we don't paint these for ourselves, we paint for the people." After we had our tour with the Bogside artist, we gained a whole new perspective on the Troubles. We went on a tour with the Protestant Apprentice Boys. The Apprentice Boys were originally 13 apprentices from various backgrounds in Derry who were sent to close the gates to Derry, a walled city. Now they are a group of protestant males who enforce that the protestant culture is remembered and honored. The Apprentice Boys lead marches where they burn the effigy of one of the traitors and remember the closing of the gates. After those two intense tours, we decompressed in the Derry Cemetery. Gabby, Molly and I spent a while walking through the section blocked off for infants. Some of these infants weren't even given names. On still born babies headstones it read "born asleep". Other headstones read "we will meet you at the gates of Heaven". To see these memorials of infants, lives that haven't even got started broke my heart. No one deserves to die, but especially such an innocent life of a baby. And yet again, just like every other cemetery even when surrounded by death, an unsettling matter, we found ourselves calm and at peace, able to reflect on life as a beautiful thing, and honor the dead. Northern Ireland is so separated and sad, and so much of it comes down to religion. However, no matter what religion, love shines through here and a sense of unity and community is forever existent. Walking into the bed and breakfast this morning we were greeted by the landowners with smiles and laughter. We sat and talked to the nice lady who took our orders and brought us our coffee which was the best I have had in Ireland so far. The breakfast was great and filled everyone up as expected. At 9:45 we walked over to the Free Derry Museum where John Kelly, a man affected first hand by Bloody Sunday, gave us an explanation about what happened and how he was affected. Hearing his side of the story gave us all a different perspective of what we had learned throughout the year. I personally learned a lot more about this important event just by walking through the museum. unfortunately we could not walk outside because of the weather. After we had explored the museum we had the rest of the day off. To end the day me and a group of people watched the movie Independence Day: Resurgence. Overall the day was packed with very interesting sights that we were able to see which allowed us to expand our knowledge of Ireland. Today is Thursday and it is also the day we headed to Derry. We got up, inhaled a continental breakfast, walked to the ferry landing, and most of us fell asleep on the 45 minute ride. Then came the two hour bus journey to lunch. On the way we stopped and visited W.B. Yeats' grave and read poetry. It was quite an interesting, and beautiful location. The poem Mrs. PH read contained Yeats’ epithet and described the beautiful scenery where he wanted to spend his eternal rest. We then stopped at the beautiful and mystical faerie land of Glencar Falls. There, a bunch of the crew found a children's playground and, me, I almost got sick on the little spiny thing (merry-go-round) that seemed vampiric and bloodthirsty and not that merry. That woozy cast wobbled onto the bus and conked out till we arrived at Sligo. There, in Sligo, we stopped for lunch and my group bought a spiral cake, for six euro, for our dining pleasure. We were then back on the bus for another 2.5 hour bus ride to Derry. In Derry we got to take over a B&B and "run amok" within boundaries of course. Then, we had dinner at the allocated dinning establishment of the night, Frankie Ramsey's Fish and Chips for fabulous, dare I say, the best, fish and chips I have had up till now. Then we ambled back to our lodgings for a night bursting with dogs barking and mysterious ladies strolling the streets near infamous and memorable Abbey Street flats. My goal for this trip, what I wanted to accomplish, was to be immersed and assimilated into a foreign culture; a culture and history comprised of countless toils and triumphs. It is day 2 of our time on the Aran Island, Inis Mor, a place not yet corrupted by capitalism and enterprise. After eating a "full Irish breakfast" our group traveled to one of the many cemeteries on the island. Now, I am typically not the type of person to get emotional, but as we were given free time to wander through the cemetery, one could feel the presence of those passed. Teary eyed, walking through the cemetery I could feel the holiness in the ground as I stumbled upon the grave stone of Shane O'Connel. Shane was 16 yrs old when she died on May 21, 2000. This grave stood out to me because I was born on May 21, 1999 just one year before her death. It’s so humbling to be on this trip, getting the opportunity of a lifetime, experiencing the rich and prideful culture of Ireland. After our brief moment at the cemetery, the group was led on a silent, reflective, hike to the top of Inis Mor. Once atop, one could observe hundreds of miles of rock walls, cattle and livestock, and farming houses. This is exactly what I was wishing to experience from my journey to Ireland. From the left one could see the bed and breakfasts, and tourist shops. In front, one could see the docks, livestock, and cemeteries. And to the right, the majestic ocean streting farther than the eye can see. Finally, for all those not on this trip back at home, imagine the wind brushing through the rocks howling, the birds singing their songs in the distance, an occasional "moo" from the cows, and a view of hundreds of miles of history, family traditions and values, and culture. This is what my group and I are currently experiencing atop a mountain that encompasses all these blessings. When we were given the opportunity of traveling to Dún Aonghasa or relaxing in the town, we chose to travel on bikes to go see the old fort along with the Worm Hole. Renting bikes, the teachers and three of us biked our way to the cliffs of Dún Aonghasa for forty minutes through rain and sun. The steep hills proved to be challenges for us but the motivation to reach our destination surpassed the sour and lethargic moods we were in. Arriving at the fort, we parked our bikes, and hiked up the rocky terrain all the way to the top. Once we entered the weathered structure, we all gazed down the edges of the cliffs to see the large crashing waves of the Atlantic. The surge of fear and excitement washed over us, tempting us to inch closer to the edge (with the exception of the constant warnings of worry from the teachers). As we walked through the three thousand year old Viking fort, we were given multiple opportunities to gain new perspectives of the cliffs and those around. The cuts of the stone were all unique in their own ways, all weathered down in some way or another. Though it would seem like a hectic environment, we were all able to gain serenity and peace from observing the crashing waves of the deep blue water. I personally have been looking forward to Dún Aonghasa ever since it was first announced, and I was beyond thrilled with my experience. The ability to gain peace in an environment such as that is almost crazy, yet I sat there on the rocks with a clear mind and an open heart. I speak for everyone who experienced this when I say we were all able to find ourselves in this experience. We found our home away from home. After the thrilling experience of the cliffs at the fort, we rode our bikes to the Worm Hole, an Olympic-sized pool crater caused by the erosion of the limestone. The walk there was certainly an adventure as we had to climb over numerous rocks, whilst trying to find the red arrows to lead us to our destination. Once we reached the coast, we were already taken with the beauty of the large waves crashing against the rocks. There were large limestone structures behind us ranging in colors from black to yellow, all in perfect lines streaming down the rocks. The interesting part of the structure was the fact that it looked like it was held up by small rocks. It was almost unbelievable that the perfectly rectangular shape of the Worm Hole (also known as Serpent Hole) was a naturally formed hole. We took our pictures (some silly ones) and headed back to our bikes for the ride home. We began our day with an early start. I am not a morning person, but I decided it was nice to be moving again despite the time. We boarded the bus as we said our goodbyes to Clayton hotel. I did not have coffee for breakfast, so the excitement of arriving at the Aran Islands alone was keeping me awake. I fell asleep anyway. By the time I woke up, the lush greenery of the Irish countryside had long replaced the gray of Galway. We were far enough from the city that street signs no longer bothered to offer English translations to tourists like ourselves. To me, this was all a welcome change. We unloaded our suitcases off of the bus and loaded ourselves onto the ferry. It moved much more energetically than the ferries I was used to, which was enough to wake me up. The ride to the islands was brief. Rain poured down as we walked along the path to the hotel. Our rooms weren't yet ready, so we left for lunch. When we got back, I was thrilled to find the rooms only needed to accommodate half the number of people as the ones at The Clayton, another welcome change. We were then free for some time to roam the island. Before dinner, the sun had come out, and I was finally able to see the teal of the water, which matched the teal houses just as accurately as the teachers had described. At dinner, we enjoyed a delicious meal and a nice conversation. I was truly relaxed. Mostly cloudy with partial sunshine is the weather in Ireland. This morning we made our way to Coole Park, the birthplace of the Irish Literary Renaissance. This estate, formerly run by playwright, Lady Gregory, is about an hour out of Galway. Lady Gregory was a friend and patron to many writers and provided Coole Park as a place where they could come and create their poems, plays, short stories, and books, among the beautiful landscape and extensive gardens. The Irish Literary Renaissance is important for the cultural revival that was so essential to Irish pride during the time of the Easter Rising, Civil War, and eventually independence. One of the main focal points is the Autograph Tree. When writers came to stay at Coole Park, Lady Gregory invited them to carve their initials into the bark of a tree. Over the years, she collected dozens of ‘autographs’ from various writers, including George Bernard Shaw and, perhaps her closest friend, W.B. Yeats (also known as Mrs. PH’s second literary boyfriend). After seeing a movie and getting a tour of the grounds, we began our own Literary Extravaganza! In Seattle, we were split up into pairs and were given the name of an author from the Irish Literary Renaissance era. Each pair researched their author and then chose a piece to perform for us at the park. We had a beautiful setting under a giant Western Red Cedar, with a stone bench called “Lady Gregory’s Seat,” with a stone wall opposite. Each pair did a tremendous job – and what better place to bring the literature alive! We then headed back to hotel and had an evening in Galway city, shopping, eating, listening to music, and enjoying each other’s company. Tomorrow we head to the Aran Islands and more of our adventure. Today was a blessing. Stellar weather allowed us to get spectacular views of the awe-inspiring Cliffs of Moher. The sun was out and a slight breeze maintained a perfect temperature. It was actually quite the opposite. The rain was torrential, more so than in Seattle. The wind blew so hard it was difficult to stand up. And worst of all, there was a thick fog covering up the majority of the cliffs. But what would this trip be without a bit of fresh Irish rain? We checked out the museum, climbed a tower, got drenched, and snapped a few pictures of the tiny bits of cliffs we could see. Then we proceeded to St. Brigid's Well. After our mood was a bit dampened by the weather at the Cliffs of Moher, it was uplifted at St. Brigid's Well. Before we set foot on the sacred grounds of the Well, Susan explained to us that the Well has proved to be a miraculous place where our dimension tends to meet others. There is a supernatural vibe at the Well, and we could feel a strong presence of God. As we walked into a small building at the Well, we observed walls covered completely by pictures, notes, statues, rosaries, and other items memorializing people who have passed on and celebrating their transition from human life to heavenly life after death. As I looked at the pictures and into the eyes of the people who had passed, it was almost as if I could feel them there in that little building. The Celtic/Irish culture does not mourn over death as much as it celebrates new life. Our group wrote little notes or prayers and placed them in the building, along with special items of rememberance. We are grateful to have participated in such a special, unique, and powerful tradition of reflection. Although I was kidding about the weather being nice, the day was still a blessing. Our trip gets better each day and we're looking forward to what the future has in store for us. Today we visited the GPO, or General Post Office of Ireland. The building itself is over one hundred years old, being a key location in the Easter Rising. While there we visited the museum down below to learn more about the history of the Irish men, women and children who lived during the 19th and 20th century. Although most of the history is very sad, it is also extremely inspiring to me. Learning about how loyal and dedicated the Irish are to their country and their will to fight for it made me feel proud to call myself Irish. Later on in our journey we reached the famous Glasnevin Cemetery which is the final resting place of over one million people. Our tour guide, a young man named Niall, led us through the busy, yet highly organized collection of tombstones. We learned about many of the people buried there, including Michael Collins and Daniel O'Connell. All of the people we learned about there proved to be amazing human rights activists and idealists, but Niall also added interesting facts about many of them that reminded me that these fantastic people were just like us, with flaws and health problems. I even learned that Michael Collin's birth date on his tombstone is incorrect. But it's in Gaelic so not many people know! In all honesty today was full of a lot of depressing history, but also inspiration. The Irish flag looks much different to me now. Dublin is great for a lot of things. There's great people, food and beautiful architecture, but there is so much hidden behind this beautiful city. Some of the world's darkest and saddest history has happened within Dublin and there isn't a single place you can go without stepping on ground where history took place. Today we visited two major places, as well as our accommodations, Trinity College. We toured, Kilmainham Gaol (jail), we then enjoyed our free time with our friends at Temple Bar, blocks dedicated to pubs, restaurants and souvenir shops. Kilmainham Gaol was home to many important political leaders during the Easter rising, and was the death place for brave individuals trying to reform their country. It was also home to prisoners coming from London and passing through on their way to Australia. Kilmainham influenced us all, the energy of that building and the heavy history there affected everyone and gave us a stronger sense of the history behind not just Dublin but all of Ireland. Temple Bar is not actually a bar, in fact, Ireland doesn't have bars, they have pubs. Temple Bar is a really fun place, just by walking in you are submerged into Irish culture. Locals wander about chatting loudly amongst themselves. Many street performers line the cobblestone paths and tourists from everywhere dart through the crowds aimlessly, like we did. 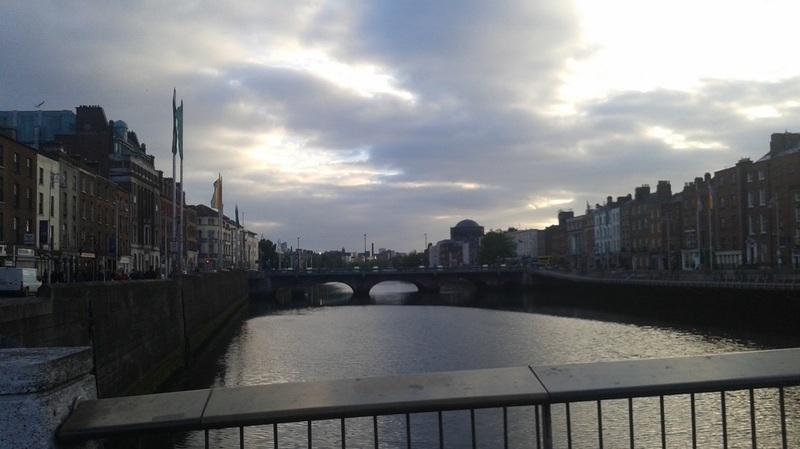 Irish people are very keen on being social and many Dubliners take great pride in their city and it's history. Every step you take in Temple Bar is reminiscent of this great happiness and pride the Irish get from their independence. It is great to see this pride in person by just walking around a few blocks. Everyone seems cheerful, and that rubs off on tourists like the us. Dublin has been great so far, one more full day and then onto the next phase of our adventure. PS: Note from the teachers --- We will do a fuller teacher update, with a bit more info when we are not completely jet lagged! We're here in Dublin! It's only been two days and we're already having the time of our lives! The goodbyes were hard to say to our families but now we're on this awesome adventure! The Delta lounge in Seattle was very nice but it was the one in New York that was really exciting! 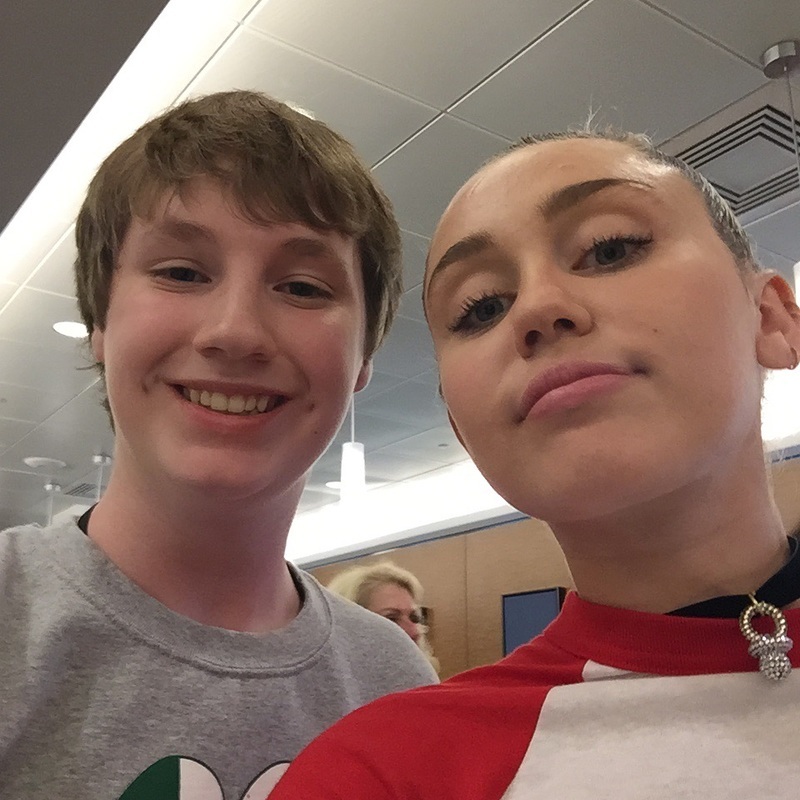 There, a few of us met (and got pictures with) Miley Cyrus! We were all super starstruck and cannot stop talking about it. The second plane ride seemed a lot longer to us than the first, and sleeping on the plane was difficult. At least there were good entertainment options. Once we landed we were all very tired, so it was nice that we were kept busy to help fight jet lag. We went on two tours, both very informational and enjoyable. 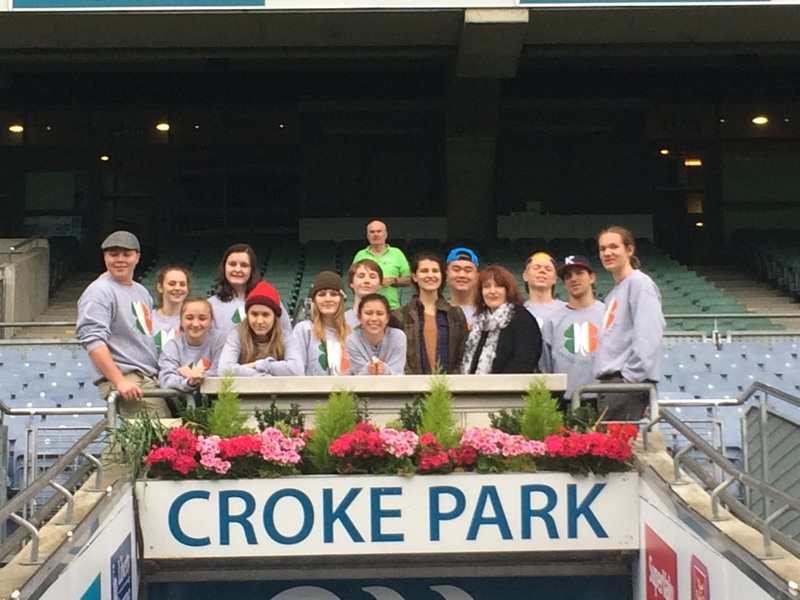 The first tour was of Croke Park (a massive stadium that has a field twice the size of a regular soccer field and a video screen the size of a tennis court). It was led by an engaging gentleman named Martin. He taught us all about the stadium's history and explained the rules of the game. He showed us the field, practice areas, locker rooms, and the players' celebration lounge. 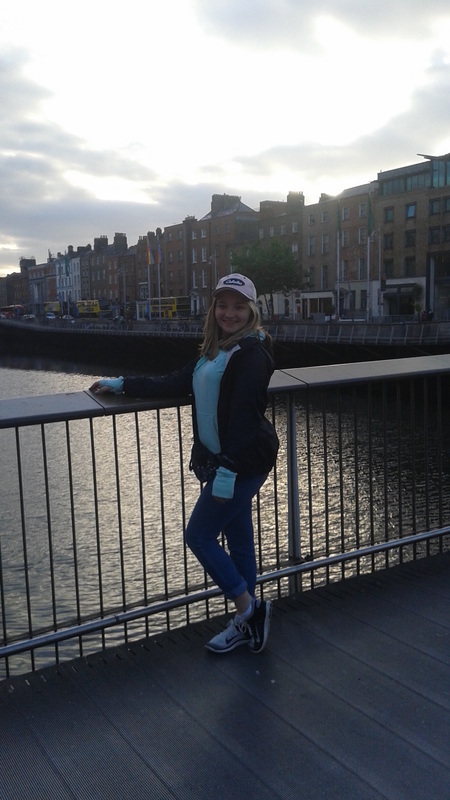 We then traveled back to Dublin and took a walking tour of the city. It was good for us to get the lay of the land and learn more about some of the buildings and events we talked about in our classes.